Many congratulations to Fufu Yang for passing the doctoral dissertation defence in Tianjin University on December 10, 2017. Fufu Yang has been studied on the interdiscipline about mechanism and structural mechanics in Motion Structure Laboratory since September 2013. He proposed a truss transformation method for transforming spatial linkages to their corresponding truss structures, which offers a novel approach for the kinematic analysis of complex linkages. 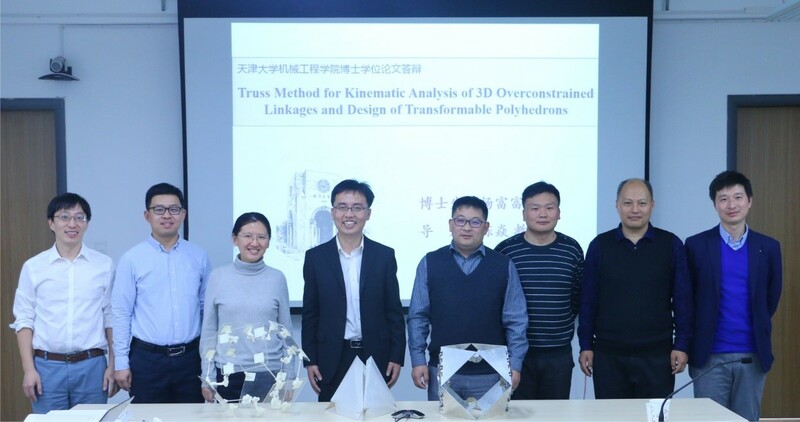 Moreover, he proposed a method for seeking non-overconstrained forms of overconstrained linkages by identifying and removing redundant bars based on the truss transformation method, which improved the tolerance capabilities of spatial overconstrained linkages for their manufacture and assembly. Furthermore, utilizing truss transformation method and considering compatibility conditions of multi-loop linkages, he realised three pairs of transformable polyhedrons with single degree of freedom, such as the transformations between cuboctahedron and octahedron, truncated octahedron and cube, truncated tetrahedron and tetrahedron, which provides theoretical solutions for the design of small satellite. With the effectively theoretical achievements, he has published two journal papers (another one is under review, one has been submitted and one is under progressing), two conference papers, three patents and attended several conference meetings. In addition, he has achieved the Excellent Doctral Thesis Proposal, the Young Delegates Program (YDP) award of the 14th IFToMM World Congress, the Best Paper Award in doctoral forum of Tianjin University, the Outstanding Student of Tianjin University, Weichai Power Scholarship, the Best Paper Award in the 2nd conference on deployable structures and the first prize in TJU’s first disruptive innovation contest for the future 30 years.